SAVE MONEY ON THIS VOLLEYBALL SUMMER SPECIAL DEAL!! Play Better Volleyball Download Set Vol. 1: Setting Coach Santiago Restrepo clearly details the five essential keys to becoming a good setter. He also shares a variety of drills to train hand placement, footwork patterns along the net and off the net, jump setting, back setting, one-hand setting, and much more. A must have resource for players and coaches at any level! 34 minutes. Vol. 2 Passing and Serving The first part of the download covers underhand passing. A wide variety of drills are shown to develop passing skills from every area of the court. In part two, the program details a wide variety of serves and serving strategies. Part three combines serving and passing into numerous team drills. The drills are designed to reinforce these essential skills in a competitive situation. A must have resource for players and coaches at any level! 53 minutes. Vol. 3 Blocking and Defense This comprehensive program details advanced defensive fundamentals, tips and drills. Among the topics covered are: ball control drills, net drills, partner drills, the run through series, blocking drills and footwork drills. This action-packed program will provide coaches at any level with the tools needed to develop a dominating defense. 74 minutes. Vol. 4 Hitting This comprehensive program details numerous techniques and drills to help your players learn and improve their hitting technique. Among the topics covered are: a complete breakdown of proper hitting mechanics, approach drills from a wide variety of different sets, and advanced hitting concepts and drills. A great resource to help advance your hitters to a higher level! 37 minutes. Mastering Men’s Volleyball: Skills and Drills Take your volleyball skills to a higher level with instruction from Hall of Fame Volleyball Coach Al Scates. In this comprehensive program, Coach Scates and his UCLA team demonstrate essential volleyball skills and a variety of individual and team drills. Among the topics covered are: serving, passing, setting, hitting, blocking and defense. This download is a great resource for players and coaches at any level of competition. 62 minutes. Mastering Men’s Volleyball: Advanced Skills and Drills Prepare to play like a champion every time you step on the court. In this unique program, Hall of Fame Coach Al Scates goes beyond the fundamentals to provide you with the advanced techniques of volleyball that are essential to winning championships. Among the topics covered are: serving, passing, setting, blocking and drills. Each chapter is like a personal coaching clinic designed to help individuals and teams drastically improve. This unique download will show you the same methods that Coach Scates has used to guide his teams to 19 NCAA championship titles during his phenomenal coaching career. 50 minutes. Mastering Men’s Volleyball: Systems of Play All of the top teams use the same offense and defense. It’s whoever does it better that’s important. In this comprehensive download, Hall of Fame Coach Al Scates presents the formula he has used to build and sustain the most successful collegiate volleyball dynasty ever. He takes you step-by-step through the middle back defense with coverage variations. He also presents the 5-1 Offense, and takes you through the entire rotation, demonstrating the ability to use a variety of plays incorporating back row and front row hitters, with the setter coming from various areas of the court. This informative download will help you coach your team to championship-level performances season after season. Mastering Men’s Volleyball: Practice Organization How does a program win 19 NCAA Volleyball Championships? Having talented players is certainly a good place to start, but effective practice organization is the glue that holds all the pieces together. In this unique program, Hall of Fame Coach Al Scates demonstrates how to maximize every minute of practice time. He covers every facet of conducting a successful practice: warm up drills, blocking, hitting, passing and competitive team drills. This download is the perfect tool for developing championship-level players and teams. 60 minutes. Volleyball Tips and Techniques Download Pat Powers is one of the nation's top instructors of volleyball skills working with over 2300 players a year at his clinics. This 70-minute download captures the essence of the clinic and all the methods that have made coach Powers and his techniques sought by so many players. Among the topics covered are: ball control, passing, setting, hitting, serving, defense, blocking, playing tips, communication and much more. 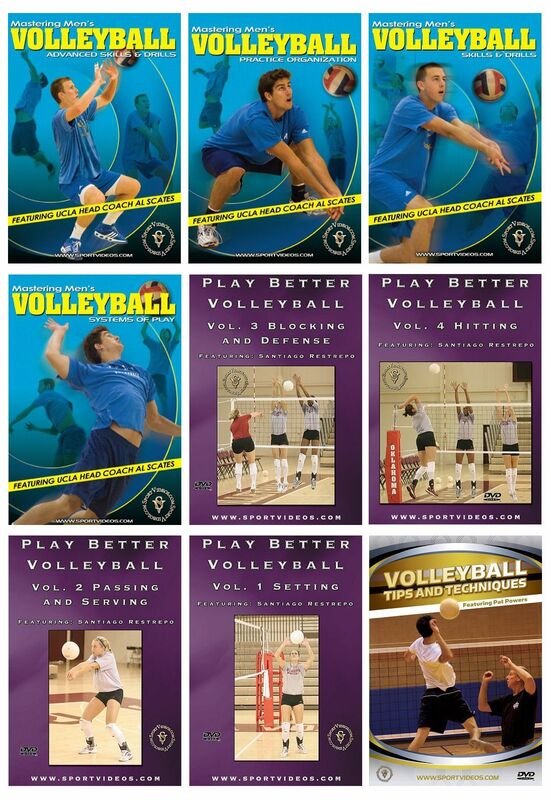 This download is a must have resource for any serious volleyball player or coach.